Formulated to attract a wide variety garden birds with sunflower husks removed for a clean feed. Derived from our Premium Garden Bird Mix. This mix has an exceptional energy content and will be of great value when nutritional demands are high. The mix has been formulated so that husks have been removed from sunflowers to avoid messy gardens although maintaining a high-energy value. 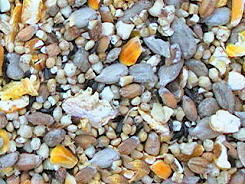 This mix has been formulated to attract a wide variety of species. Contains: Sunflower Hearts, Chopped Peanuts, Millet, pinehead Oats, Nyger Seed, Wheat, Kibbled Maize.